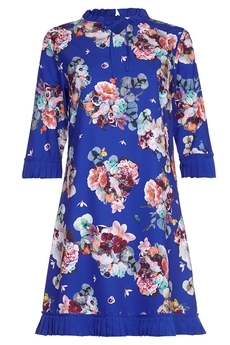 Midnight Floral Tunic-dress is perfect for parties and nights-out. Designed in a relaxed A-line silhouette with pleats along the neck, sleeve and hem. Is decorated with a night garden flower on soft, silky, fluid fabric and features neck-tie which adds a retro touch. Has concealed side zip fastening, it is fully lined and is approx. 92cm in length. Winter collection. Composition: 100% Polyester. Color: Blue.